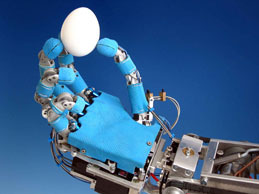 Over the years we have developed many robots, each dedicated to quite different scientific questions. Despite the diversity (or perhaps just because of the diversity), some key concepts have emerged, which we regard as essential, and which we combined without compromise in our latest humanoid robot Myon. 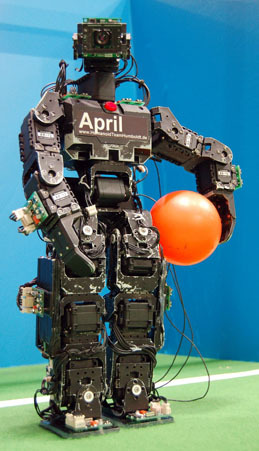 The modular robot Myon was completely conceived, developed and built within the context of the European project ALEAR. 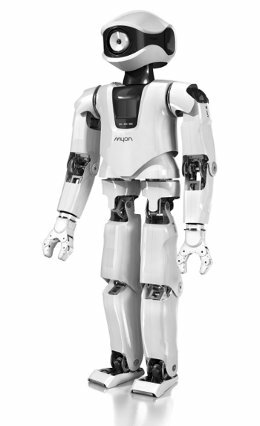 Myon consists of five identical humanoid robots. Through intensive collaboration with Frackenpohl Poulheim and Bayer MaterialScience, Myon and its four congeners could be furnished with an exterior skin which allows both rational (fall protection, grip surfaces) and emotional (acceptance, reducing fears) functions to be fulfilled. Egyptian Semni literally means to establish oneself - and this is precisely the goal of the self-exploring multi-neural individual. Semni palpates itself and its environment in a careful manner and to discover what motor actions are effective and which ones cost an enormous amount of energy. With time, Semni tries increasingly acrobatic movements. He learns to have fun with his own body control. The A-series, consisting of five robots, is based on the modular system Bioloid of the company Robotis that has been extended by specially developed AccelBoards, which are able to process sensorimotor processing data in a distributed manner. 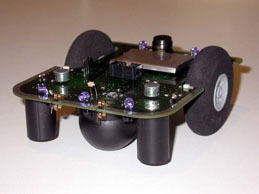 The AccelBoards are attached to the robot at various body extremities, so that the different body regions can be detected by sensors. 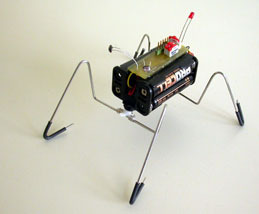 The walking machine Oktavio consists of a body and eight legs of identical design, which are attached by snap closure at the trunk. 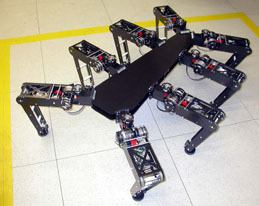 Jointly developed and built by Dr. Manfred Hild and Torsten Siedel, the robot is 150cm long, 100cm wide and 30cm high. Oktavio was the first distributed system that works without a central processing unit. Essential concepts of Oktavio are used in advanced form for Myon. Because of its ability for acoustic communication, the Do:Little received its name in line with Eliza Doolittle from Shaw's Pygmalion. The Do:Little governs not only the directional hearing - he also possesses unusual gustatory and proprioceptive sensors. Using bronze coloured spring contacts at the front and silver contact strips around the body, several Do:Littles can help out each other with energy and also recognize this. The acronym TED stands for Two-degrees-of-freedom Experimental Device and refers to a robot held minimal in all respects which is however still able to move on legs. TED was created primarily as a demonstration and experimenting object. It only takes a few pieces and an afternoon to assemble a TED on your own, to bend individual leg shapes and install your self-created neural network. 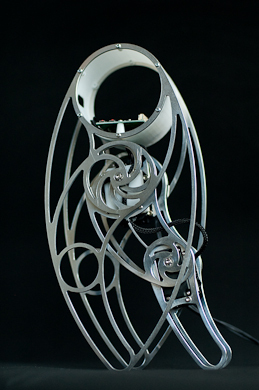 Modeled after his own hand, the universal gripper was developed by Torsten Siedel and was enhanced by Dr. Manfred Hild with electronics and neural control. It is controlled intuitively with a specially made data glove via haptic feedback: you can feel it with your own hand if the universal gripper grasps and holds something.